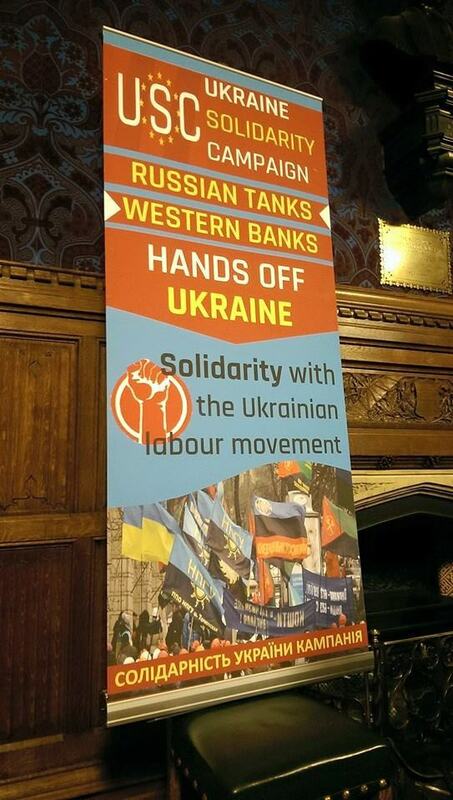 The Ukraine Solidarity Campaign held a packed meeting in the House of Commons on 10th March addressed by Yuriy Samoylov, Chairman of the NGPU – independent Trade Union of Miners of Ukraine in Kryvyi Rih. The meeting was hosted by Labour Party MP’s John McDonnell and Ian Lavery, and attended by a wide range of labour movement activists including a number of Ukrainian trade unionists and workers living in England. Yury left, with NGPU comrades. The NGPU is an affiliate of the Confederation of Free Trade Unions ( KVPU ) which is part of International Trade Union Confederation International Trade Union Confederation that includes the Trade Union Congress (TUC )in England and Wales. In chilling words which should remind us of the courage of Ukrainian trade unionists Yuriy who has faced death treats said that “Meetings like this are important because we may not be alive for very much longer.” With regard to the current situation he rejected those politicians who after EuroMaidan say the ‘revolution is over’ and insisted ‘it is not over’and that Ukrainian workers are willing to fight! 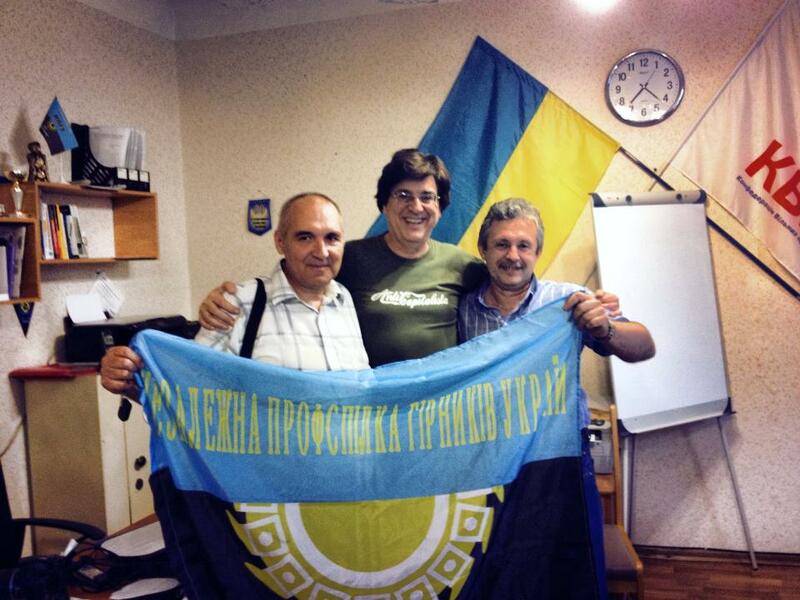 The Ukraine Solidarity Campaign is planning further events in solidarity with Ukrainian trade miners and will be part of labour movement delegation visiting Ukraine this month. 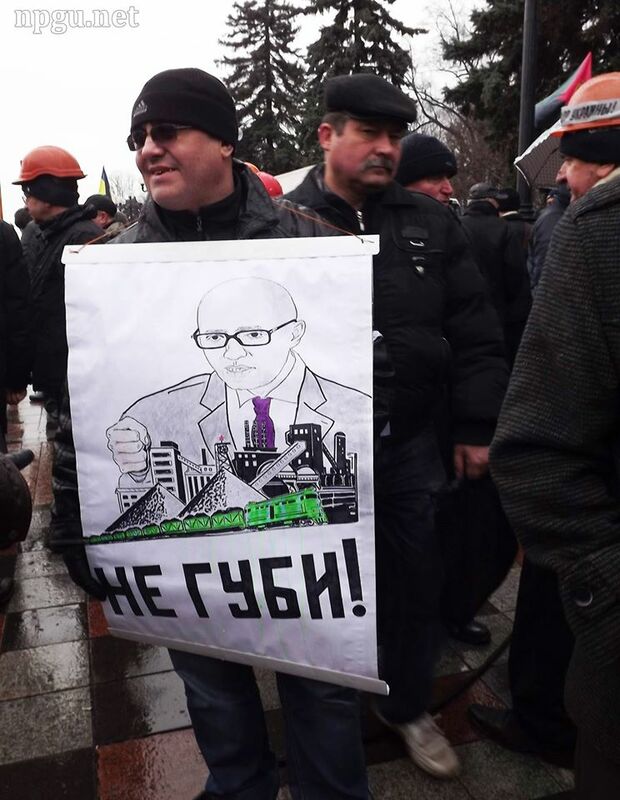 Miners protest at the Ukrainian Parliament: Poster warns Prime Minister Arseniy Yatsenyuk not to destroy the mining industry!